A friend of mine is a teacher, a very good one. So good, in fact, that if I could somehow transform into a young student and attend his class, I believe I would be richer for it. Personally, I enjoy teaching. I’ve done it a few times in my life. Never as my primary source of income; sometimes for pay, sometimes for free. Between the long chats I’ve had with my friend and my own experiences, I can certainly say there’s value in teaching. Does our society respect that value by adequately compensating teachers? Ideally, how much should a teacher make relative to other professions? Consider jobs like engineers, doctors, sanitation workers (who persistently earn my respect and thanks), landscapers (who work in the rain), nursing care providers of all varieties, financial advisors, and veterinarians. Where should teachers rank in that group? 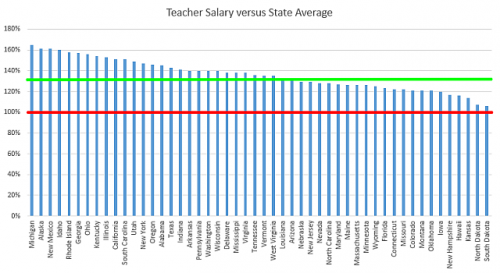 What should a teacher’s salary be relative to the average salary of everyone else? Certainly, it’s an important and valuable job, so maybe they should be paid more than the average. Maybe 120% of the average salary. Maybe 130% for really good teachers like my friend. 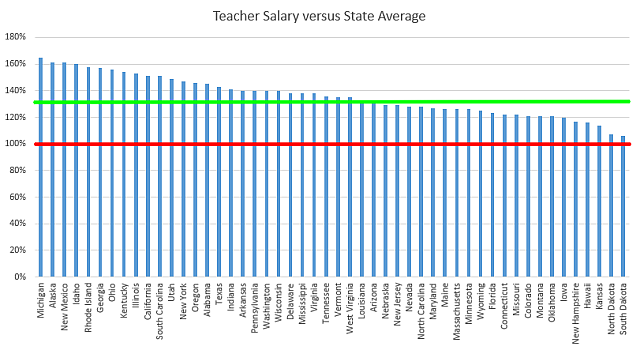 Turns out, Washington isn’t actually all that exceptional when it comes to teacher pay relative to the average salary of the state. We’re just a few places up from the median. 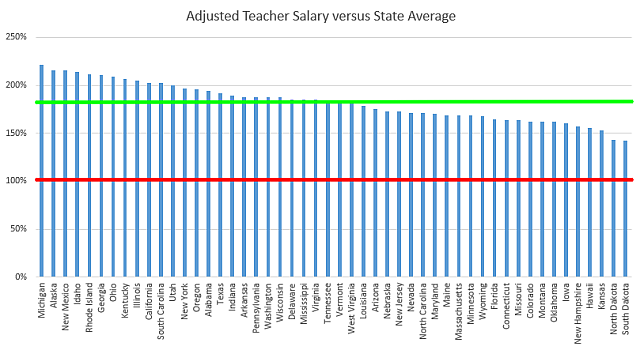 On average across all the states, teachers are paid about 136% the average. That’s rather remarkable. It seems we do indeed value teachers. However, in collecting the data from Teach.com, I noticed that vacation time for teachers was 15 weeks per year. That’s a lot of vacation time, it seemed to me. When I started working a full-time salaried position out of college, I got 2 weeks paid vacation. After several years, I got up to 4 weeks (or 20 working days). That’s a far cry from 15 weeks (or 75 working days). According to a Wikipedia article about annual leave, the US average is 12 days. With salaries adjusted for the disparity in vacation days, the US average for teacher pay is 182% the average for other jobs. 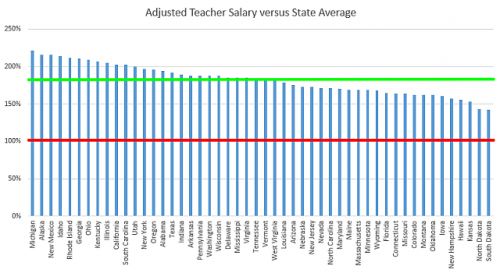 So teachers are getting paid not quite double what everybody else gets paid. Good.